The Clean Energy Initiative? What Clean Energy Initiative? Today, Gov. David Ige committed the state of Hawaii to nation-leading goals for clean energy generation. Passed wholeheartedly by the state legislature in its most recent session, the four bills push Hawaii to wean itself off of fossil fuels entirely over the next three decades, requiring that 100 percent of the energy it uses come from renewable sources by the year 2045. That final target also comes with steeper milestones to hit by 2020 and 2030. Steeper compared to the Hawaii Clean Energy Initiative, that is, a similar package put together in 2008 by then-Governor Linda Lingle. 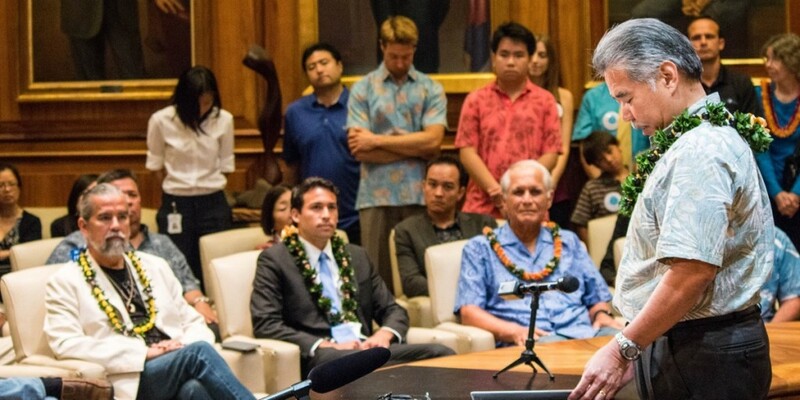 The HCEI, which set a target of 70 percent renewable energy generation by 2030, was quietly rescinded last fall by then-Governor Neil Abercrombie. Today’s bills, notably HB 623, shifts the energy independence mantle onto Gov. 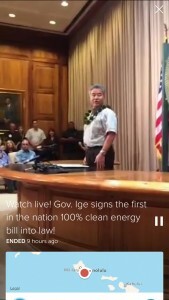 Ige’s shoulders early into his administration. Local renewable projects are already cheaper than liquid natural gas and oil, and our progress toward meeting our renewable energy standards has already saved local residents hundreds of millions on their electric bills. Moving to 100 percent renewable energy will do more to reduce energy prices for local residents in the long term than almost anything else we could do. The bill signing ceremony today was broadcast live by the Blue Planet Foundation using Periscope, the Twitter-owned livestreaming app. Like Twitter itself, there were some rude comments from passing trolls, but the celebratory nature of the gathering still came through. HB 623: Increases the renewable portfolio standard to 30 percent by 2020, 70 percent by 2040, and 100 percent by 2045. SB 1050: Requires utilities to support community-based renewable energy programs (growing incentives beyond rooftop solar). HB 1509: Requires UH to become net-zero with respect to energy use by January 1, 2035. HB 1296:Establishes a Hydrogen Implementation Working Group, and creates the position of State Hydrogen Implementation Coordinator. The Blue Planet Foundation had worked with legislators to draft HB 623 and led a grassroots campaign to pass it. According to the group, 29 states plus Washington, D.C. have renewable energy standards, and Hawaii already had the most ambitious since 2009… but some states have already exceeded their goals, achieving 60 to 90 percent renewable energy generation in recent years. Hawaii’s new goal is comparable to many set by entire countries: island nations Tuvalu and Cape Verde want to be off fossil fuels by 2020, Denmark by 2050. Photo and image courtesy Blue Planet Foundation.